Cameras and co-operation are helping to improve suckler cow performance on a Welsh livestock holding. Barry Alston reports. A Mid Wales hill farming family has turned to technology and teamwork to cut costs and improve returns from its beef rearing operation. An investment of more than £3,000 into closed circuit television cameras has greatly reduced calf mortality levels, while linking up with four other like-minded producers in a self-help marketing co-operative is providing a premium return. Robert Jenkins and his family run a 130-cow Black Limousin cross Friesian suckler herd, plus 2,500 ewes in the uplands of Montgomeryshire. The system has always focused on low-cost production, with all lambs finished off grass, but one area found to be in need of attention was the growing number of calf losses. One factor considered to be contributing to the high level of mortalities was the cows being out at grass pre-calving and becoming too well conditioned. In just one year, losses peaked at more than 10 per cent, costing the business dearly. As such, a change in the system was considered necessary and one key element in tackling this was the installation of cameras covering the calving pens. It means all the cows on the point of giving birth can be closely monitored day and night. Strategically located, each camera is fully automated with tilt, swivel and zoom facilities and they are capable of reading ear tag numbers. They cost about £3,000 to install but the payback has been immediate. Last year there were no losses and the year before only one. “It means we can keep a close eye on what is happening in each pen at all times,” says Mr Jenkins, who has taken the technology even further by installing security cameras at strategic points round the farm. 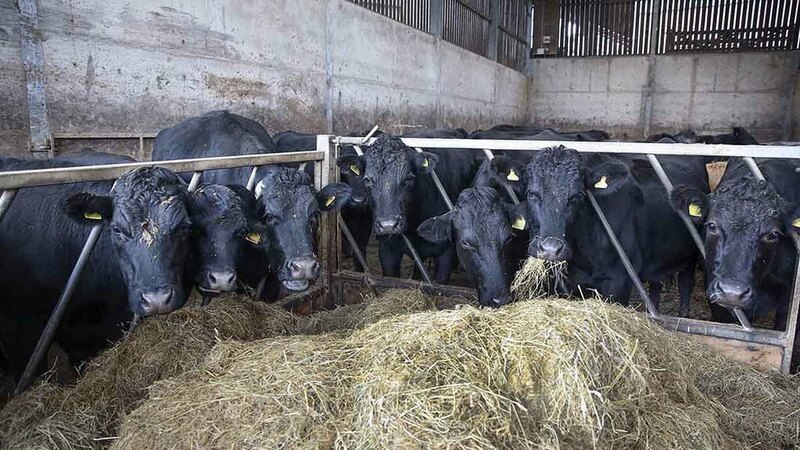 Cows are also being housed on silage two weeks before calving and this ability to restrict their diet is considered to be another contributory factor in reducing losses. Minimising losses and rearing stock more efficiently is just one approach which has been adopted in the bid to improve market returns. Mr Jenkins is one of five like-minded Mid Wales livestock farmers who have banded together to market their own branded beef direct to high-end restaurants and hotels. With the backing of the Cambrian Mountains Initiative, Cambrian Mountains Beef has been established to develop a significant market for cattle finished on the upland pastures of the picturesque mountain range, which covers about 10 per cent of Wales and is one of the most sparsely populated areas in England and Wales. While still in its infancy, the group has established a high profile website and, having offered free tastings of the product at events in London, there has been plenty of interest. Orders are being filled by stock supplied in turn by one of the group members who benefit by way of a premium return set at 40p/kg above the GB 4L price for the week. A 5p/kg levy is being deducted to sustain the group and the individual producer stands the slaughtering costs of about £30. Stock specification has been set for finished cattle in the weight range of 290kg-400kg, with carcases E to 0+ and conformation between 3L and 4H fat class. The Jenkins family keep 130 Black Limousin cross Friesians. The beef enterprise is focused on producing stores to sell at eight to 10 months. Animals are being slaughtered at a fully assured abattoir no more than 15 miles from all the group members, and meat is matured for up to 30 days to ensure maximum eating quality. The product is then backed with Welsh Beef status and Farm Assured membership. “The initiative has the full backing of Prince Charles, with the group logo being based on a watercolour painted by him, and it is in tune with his support for traditional family farms,” says Mr Jenkins. He is the third generation of his family to farm the all-grass Cilhaul, Trefeglwys, between Newtown and Caersws, and he and his wife, Fiona, have four children – Edward, who also works on-farm; Owain, who is studying agriculture at Hartpury College, Gloucestershire; Catherine, a music student at Cardiff University; and Ruth, who is still in school. His grandfather originally bought the farm from the local estate, although the holding has doubled in size since. It now covers 445 hectares (1,100 acres) of owned ground in a single block, running from 152-390 metres (500-1,275 feet) in altitude, with annual rainfall of 1,270mm. The beef enterprise is primarily focused on producing stores to sell at 10-11 months old, but with some now being retained for the Cambrian Initiative. Cows go to one of four Charolais bulls sourced from local farms while heifers run with a Hereford bull for easier calving. The main calving period is from May to July, plus about 20 cows calving in August and September. Calves are creep fed from July and winter housed with their mothers until weaning on January 1. 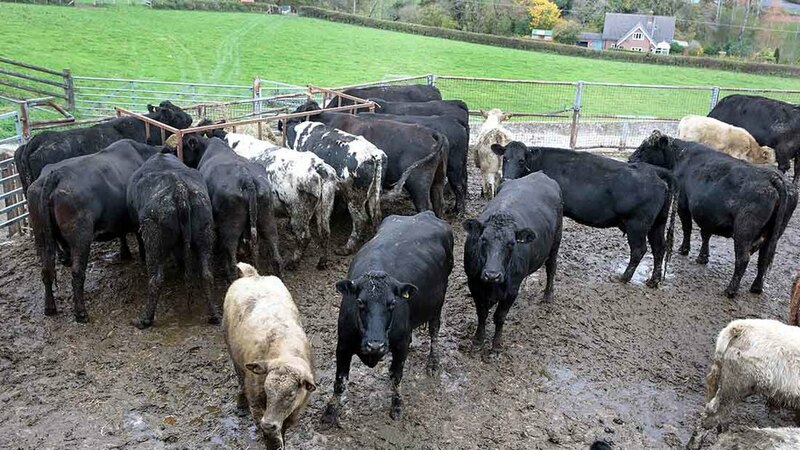 Reared on silage and a blended feed, they are sold at 450-500kg at Welshpool in March and April, a system which suits the farm and the breed, says Mr Jenkins. “I would rather sell at 10 months for an average of £950 than keep them for another year and sell at £1,100-£1,200,” he adds. Longevity is another positive feature of the herd, with many cows still being productive after 11 calvings. Herd replacements are bought-in as heifers with calves at foot and sourced from a single farm in North Wales. Mr Jenkins readily admits he would calve earlier in March in an ideal world, but this would coincide with lambing and put pressure on housing. The sheep enterprise revolves round two flocks – one of 1,200 Speckled Faced and Welsh ewes and the other of 1,300 Welsh Mules, all wintered at home rather than being sent away on tack. Edward also has a 40-ewe pedigree Texel flock producing tups to put on Welsh Mules. Half the Speckled Face and Welsh ewes are kept pure and the remainder go to a Bluefaced Leicester ram. Up to 750 ewe lambs are retained each year. All the lambs go to Randall Parker Foods, less than four miles away at Llanidloes, destined for supermarkets across the UK. On the cards, however, is a reduction in the number of Speckled Faced ewes in the flock and a switch to all pure Welsh. “The nucleus of Speckled tups we can buy in this area is small, which leads to a risk of inbreeding,” says Mr Jenkins. Last year the Mules scanned at 195 per cent, with losses of only 5 per cent between scanning and selling. They lamb indoors from March 10, with the Speckles and Welsh following on from April 1, again using the cameras. Grass is the only feed given to lambs, with the aim of getting them all away by the end of November. Caring for the environment has been an important part of the family’s farming system for many years. Up to 6,000 metres of hedges have been layered and double fenced under the former Tir Gofal agri-environment scheme and a further 2,000 metres undertaken by way of the replacement Glastir Advanced scheme. Trees have also been planted through the better Woodlands for Wales scheme and 20ha (50 acres) of woodland have been designated as a Site of Special Scientific Interest. Fertiliser inputs have been cut – with just one dressing of one and a half hundredweight of nitrogen now being applied in spring. This has been achieved by applying more lime and increasing inputs of phosphate and potash. As on all farms with cattle, there is always a day to be feared. Testing for TB could determine business performance for the whole year. “When we are doing a pre-movement test before cattle go out in spring, my heart is always in my mouth. If we have a reactor it might mean we are stuck with 130 cattle and calves for summer and this is a huge financial burden,” says Mr Jenkins. He also has concerns about the accuracy of the test and is worried about plans to tighten cattle controls further. With suckler cows having an important role to play in maintaining the biodiversity on so many hill farms, he also believes there is a case for direct support for farmers to graze cattle in the uplands. “Sucklers are important for the agri-environment and an asset which farmers in hill areas should be encouraged to expand – but to make them pay there has to be direct support,” believes Mr Jenkins, who has recently taken on the role of Montgomeryshire NFU county chairman. “Lots of farms have gone out of cows but not everyone can diversify into poultry or look to provide bed and breakfast accommodation. 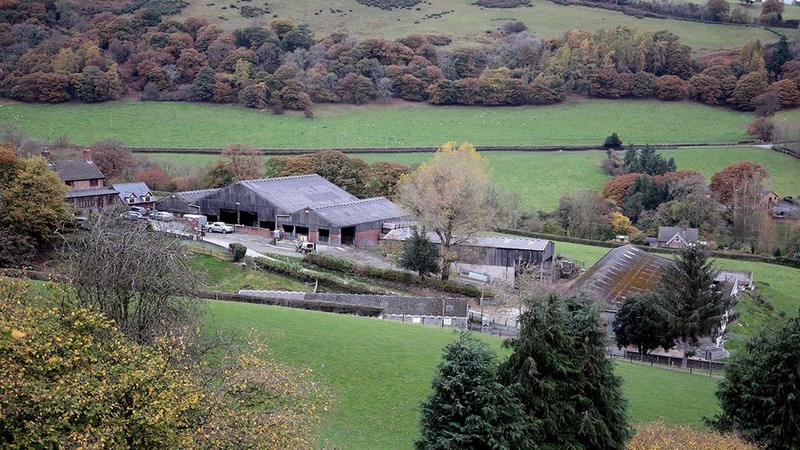 Cilhaul Farm comprises 445 hectares (1,100 acres) of grass in the Montgomery hills. Lambs finished and sold deadweight to Randall Parker Foods.